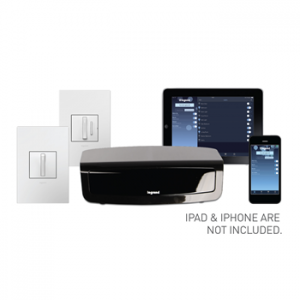 App-based lighting control is easy with our Wi-Fi Ready Starter Kit. 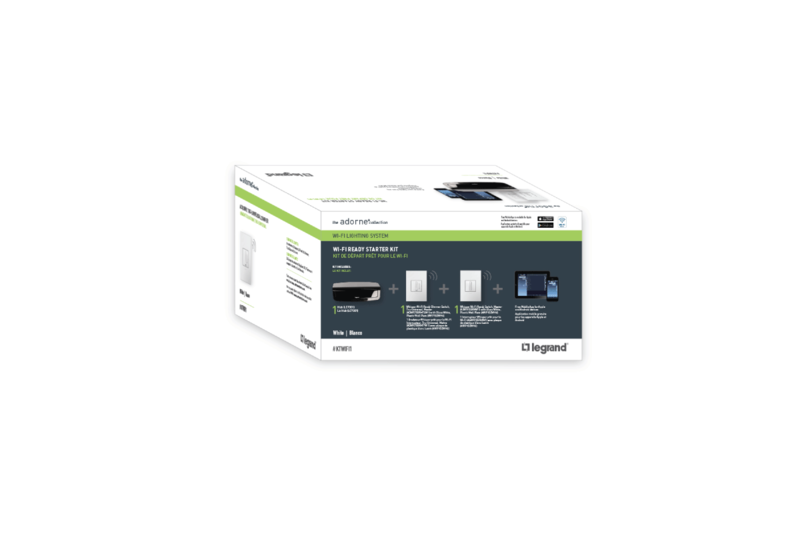 The kit includes everything you need to get started, including a switch, a dimmer, wall plates, and the Hub. The Whisper Wi-Fi Ready Master Dimmer is a programmable light switch and dimmer combination that pairs with the adorne Hub to create smart lighting solutions for your home. The adorne Hub is our Wi-Fi Lighting system’s central command center, letting you control your lights from your smartphone or tablet via the free Legrand Lighting Control app. Control and schedule more than 100 light scenes and zones, from setting the mood for a party or setting lights to automatically turn on while you’re away. You can manually or automatically control your lights. This system is compatible with the Google Assistant and Amazon Alexa. The Wi-Fi Ready Starter Kit is the perfect fit for contractors and builders who have homeowners that are interested in the smart, connected home. The kit offers Wi-Fi lighting on a small scale that is able to be expanded to additional devices and rooms depending on the customers wants and needs. The Wi-Fi Ready Starter Kit is a perfect up-sell for the homeowner that is interested in the connected home but hesitant about full home automation. The Master Switch and Master Dimmer Switch are easy to install and fit in an existing electrical box and wire directly to the light. For the Hub, simply plug it into your home wireless network and pair with the adorne Master Whisper Switch and Dimmer Switch. The Wi-Fi Ready Starter Kit allows homeowners to control the lighting in their home from their smartphone; with Wi-Fi lighting homeowners are now able to turn their lights on and off even when they’re outside their home. Integration with Amazon Alexa and Google Assistant means homeowners can control their home lighting by saying things like “Alexa, turn off the kitchen lights” or “Ok, Google dim the dining room lights to 75%” without ever having to touch a light switch or dimmer! Our Wi-Fi Ready Starter Kit is the perfect choice for any homeowner interesting in transforming their home into a smart home.